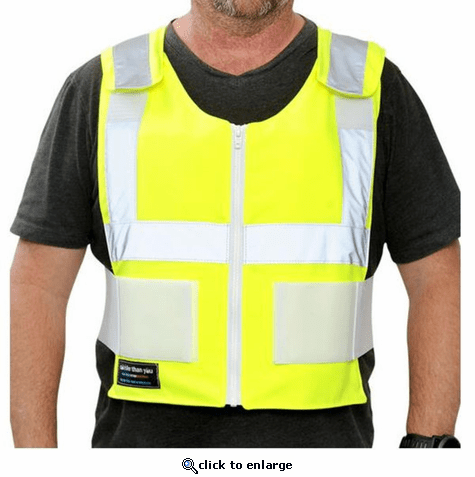 If you’re on the clock early in the day or at night, the High Visibility Cool Vest lets people know you’re there while simultaneously cooling you down. In addition to the high visibility reflective striping, this vest includes a GlacierPack Protect set. Made from stretchable specialty film, these packs are able to endure significant impact. The bright coloring and reflective striping of the High Visibility Cool Vest helps ensure that others see you, while the GlacierPacks keep your body cool and comfortable. The vest features side elastic straps and over-the-shoulder adjustability to fit a wide range of body sizes. To clean, simply hand wash the vest with cold water and allow to line dry. This cooling vest also includes a heavy duty front zipper for easy on/off wear.